•	An unbelievably low price. 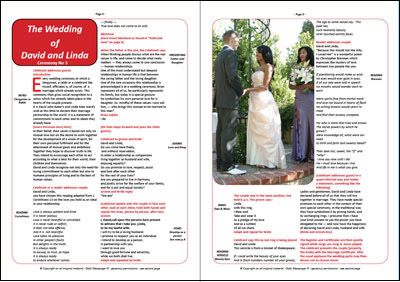 •	Five totally different wedding ceremonies, on five double page spreads. •	In full colour. Beautifully set out and designed. •	Completely updated — incorporating the latgest changes in interpetation of the Marriage Act. •	Guideline articles on preparing for, and organising you wedding ceremony.